There are a number of ear diseases, some of which are mild while the others can be of serious and painful nature. In most of the cases, however, these are the infections. Usually, the ear infections affect infants as well as young children. Sometimes, certain conditions can also impair your sense of hearing. The common ear disorders include infections, injuries and tinnitus. Interestingly, tinnitus is a condition in which the victim experiences roaring in the ears. However, it may not essentially be a disorder but a symptom of some other condition. For instance, it may occur due to the excessive use of medicines, hearing loud voices and different other causative factors. You might have heard of the Meniere’s disease which, usually, involves the symptoms of dizziness and tinnitus. In this case, there are fluid problems in the inner ear. On the other hand, ear barotrauma is an injury of this body organ. As the very name suggests, it results from changes in the barometric or air pressure. Here follows a brief description of some of the commonly occurring ear disorders. Otitis is one of the common ear diseases referring to inflammation of ear. This swelling may be due to some ear infection. The condition can occur in both external and middle ear canals. Otitis externa has also got the name of swimmer's ear. You call it “swimmer’s ear” especially because the inflection may be due to prolonged swimming activity in water. In this type of the ear diseases, the human ear hurts if you touch or pull its external part. Here is a sub-type of otitis, i.e. the otitis media. 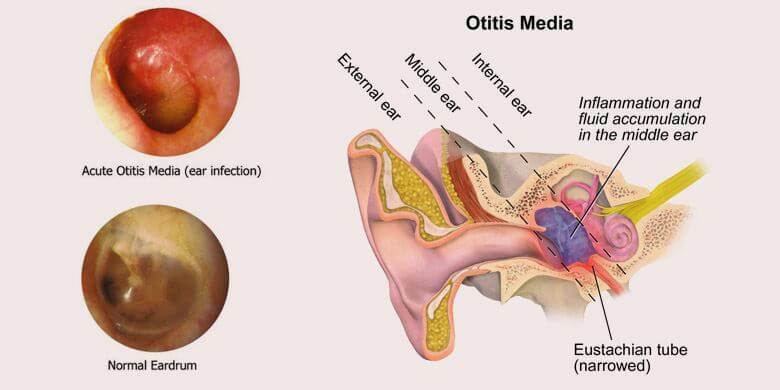 Otitis media refers to inflammation of the middle ear, where the purulent fluids fill the air spaces. Another peculiar thing about this disease is that it commonly occurs in children. People with frequent and complicated colds are predisposal for otitis media. On the other hand, if otitis affects only the passage of the external ear, you would call it otitis externa. Similarly, otitis internal or labyrinthitis refers to the inflammation of the inner ear. There can be different causes of otitis. In case of otitis media, for example, the bacteria and viruses living in the throat can cause the infection. They reach the middle ear while travelling through the Eustachian tube. The Eustachian tube is a passage that runs from the back of the throat and reaches the middle ear. When bacteria and viruses enter this tube, they cause swelling and accumulation of fluid in the middle ear. The swelling or blockage of the Eustachian tube can result from cold, allergies, sinus infection, flu, cigarette smoke, and enlarged adenoids, etc. Inflammation causes pain which, in turn, may become unbearable and lead to crying in infants and children. Here are some of the common symptoms of the three otitis ear diseases in general. Irritation in the outer, middle or inner ear. Severe pain in or around the ear. Pulling on the ear and a feeling of fullness in the ear. The treatment may vary depending upon the area of infection, i.e. external, middle or internal ear. For example, in case of otitis external, you need to remove debris, manage pain and use topical medications, such as eardrops. The topical eardrops include antifungal preparations, acetic acid drops and antibacterial drops. It would be even better if you avoid the contributing factors. The severe internal infections, however, may require surgery. When infections of the middle ear diseases spread to the inner ear, it results in one of the inner ear diseases, i.e. vertigo. 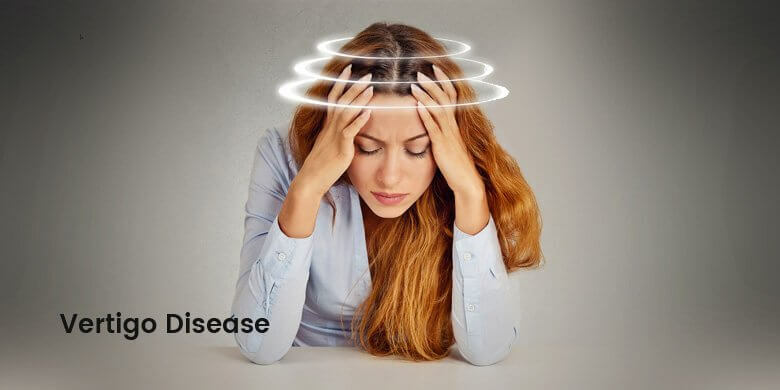 Vertigo is the perception of whirling or spinning, which you commonly describe as dizziness. The victim either perceives the walls to be moving around them, or they are moving in a circular motion. The person experiences inappropriate spinning motions of the body with several compromises on body balances. Such ear diseases also involve the symptoms of vomiting, and difficulty to stand and walk straight. The treatment of the disorder usually depends upon the fundamental cause of dizziness. The troublesome sensation of spinning and dizzy spells usually occurs due an infection of the inner ear. Such infections, in turn, are associated with a number of conditions, for example, labyrinthitis, Meniere’s disease and benign paroxysmal positional vertigo, etc. In case of labyrinthitis or vestibular neuritis, a viral infection leads to inflammation of the nerves that are responsible for maintaining the body balance. Jerking or abnormal movements of the eye. Staggering and pulled to one direction. As there can be different causes of this type of ear diseases, the vertigo treatment shall depend on the particular causative factor. It is quite surprising to note that, in most of the cases, your brain is able to adopt to changes in the inner ear by switching on other mechanisms for maintain balance. Obviously, if this be the case, you won’t need to worry about the treatment of the disorder. However, if victim is experiencing recurrent bouts of vertigo or other painful conditions, they need some sort of treatment. The common treatment methods include vestibular rehabilitation, canalith repositioning maneuvers, use of medications and surgery. This is one of the very common ear diseases in people who are habitual of picking ears with finger or hard object to remove dirt and wax. Frequent poking results in perforation of the eardrum (tympanic membrane). The tympanic membrane has the thickness equivalent to a single strand of hair. 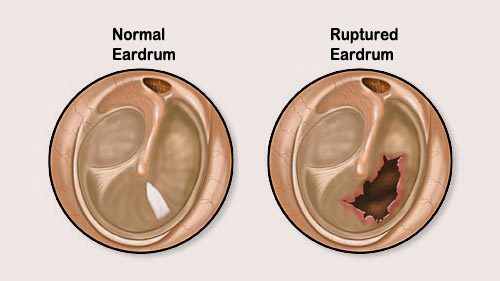 The rupture of eardrum also results in unintended infections of the middle and inner ear as the protective coating gets torn or damaged. Though the membrane can heal on its own, it usually takes a lot of time. The slow healing paves way for other accidental ear diseases. One of the common causes of the rupture of eardrum is that of infection in the middle ear. It may also result from an injury to the eardrum. It happens when you poke an object, such as a cotton stick, deep into the ear or receive a severe blow to the ear. At the same time, a sudden loud noise, as that of an explosion, also has the potential to rupture the ear drum. There is pain in the ear which may alleviate quickly. Discharge of pus or bloody fluid from the ear. Sensation of spinning (vertigo) and ringing (tinnitus) in the ear. 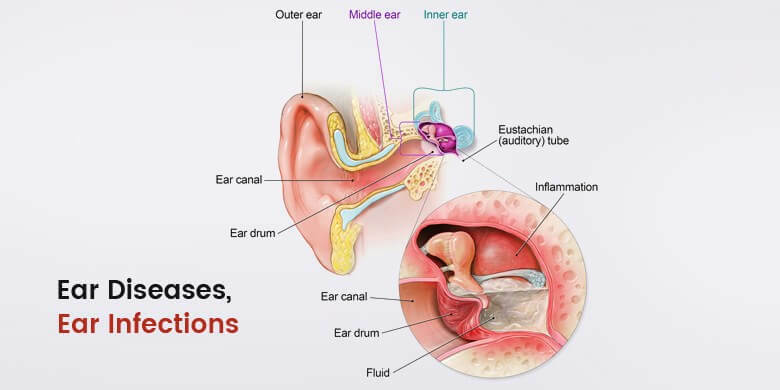 Though, in the majority of the cases, there is no need to get a treatment for the ruptured ear drum, the natural process of healing may take a long time to complete, i.e. up to three or more. However, sometimes, your healthcare provider may recommend the use of oral antibiotic drugs or eardrops. For alleviating pain, the victims can take certain over-the-counter pain killer medicines, like ibuprofen and acetaminophen. As most of the ear diseases are painful, you should try to avoid the factors that cause them. If, unfortunately, you happen to contact any such condition, it should be treated timely with medication or other appropriate treatment method.